1995 reissue of the 1990 compact disc compilation The Greatest Love Songs Of All in new packaging that includes liner notes. Theirs is a collaboration which literally began when they were children. Piano prodigies who both began to pick out tunes on the piano at two, the six-year-old Louis Teicher met nine-year-old Arthur Ferrante while they were studying at the Juilliard School of Music in Manhattan. They ultimately grew up and became one of the most successful two-piano teams in musical history. It wasn’t that easy a transition, however. A long, and sometimes bitter, struggle continued for the next twelve years. After their graduation as piano majors from Juilliard, Ferrante and Teicher initially were forced to combine teaching with their concert work to earn a living. Finally, in 1948, they were able to become full-time piano duettists, and toured America and Canada with leading classical orchestras. Though they acquired vast critical acclaim, little financial recompense was in the offing. Slowly, their musical repertoire moved away from the classics toward the more popular music of Richard Rodgers, Cole Porter, and Jerome Kern. Their audience broadened, as did their approach to playing. Performing popular music allowed Ferrante and Teicher musical latitude unacceptable in the classics. They adapted their pianos to produce strange effects such as gongs, drums, and other instruments long before the synthesizer made these techniques accessible to everyone. Ferrante and Teicher’s music was precedent shattering. Thought Ferrante and Teicher had been recording intermittently for several labels throughout the years, it was not until 1960, when they signed a contact with United Artists, that they recorded their first big hit. From then on, the names of Ferrante & Teicher became synonymous with great popular piano music. They went on to sell over 20 million records including eight gold LPs and three million-selling singles. Because romance and piano music have been intertwined, Ferrante & Teicher’s special talents make this fine collection especially magical. Their renditions of classics like “The Greatest Love,” “You Don’t Bring Me Flowers,” “Cast Your Fate to The Wind,” and “Nadia’s Theme” reinvent these fine melodies and illustrate why they have become models of contemporary hit songs. Ferrante & Teicher pay tribute to great contemporary musicians and songwriters on this collection. Singer Roberta Flack is saluted with two great performances: Ferrante and Teicher’s glorious interpretations of her hits, “Killing Me Softly With His Song” and “The First Time Ever I Saw Your Face.” They pay homage to The Carpenters with their recordings of three of their greatest hits: “Rainy Days And Mondays,” “(The Long To Be) Close To You,” and “We’ve Only Just Begun.” Ferrante & Teicher’s sensitive reworking of these beloved songs makes them their own without ignoring the quality of the originals. And Ferrante & Teicher’s masterful piano duets of the familiar, timeless music of The Beatles is classic in itself. Their versions of “All You Need Is Love,” “Yesterday,” and “Something” prove that these songs are indeed among the greatest love songs of all. Four other contemporary love classics are included in this collection: “You Needed Me,” “You Are The Sunshine Of My Life,” “Feelings,” and “If.” Each of these love songs conveys a real spirit of romance and devotion, augmented by the special genius of Ferrante and Teicher. 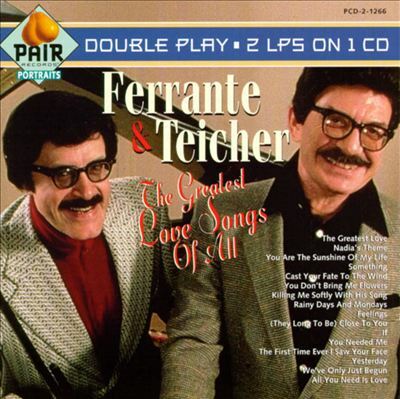 The unique piano duets of Arthur Ferrante and Louis Teicher occupy a special place in the world of music. And the millions of fans they have garnered throughout the world overwhelmingly attest to their musical genius.